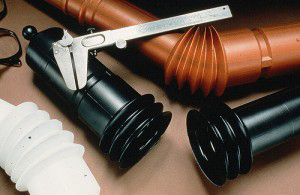 What’s the Difference Between Thermoset Polymer and Thermoplastic? When you’re trying to choose the best kind of plastic for your new plastic mold you’re going to discover there are dozens of options to choose from. The plastics research phase can be quite confusing and overwhelming. The plastic you end up choosing for your new mold will depend upon the ways in which you’ll be using your plastic product or plastic component. The plastic material choice will also depend on the goals of your new mold. Without these details ironed out it’ll be much more difficult to decide which plastic and plastic process is best suited for your needs. Two commonly used types of plastic include a thermoset polymer and thermoplastic. A lot of people confuse these two types of plastic due to name similarities. Below we highlight the crucial differences between these plastic types, as well as the style of final molds you can expect from using either thermoset Polymer and thermoplastic. 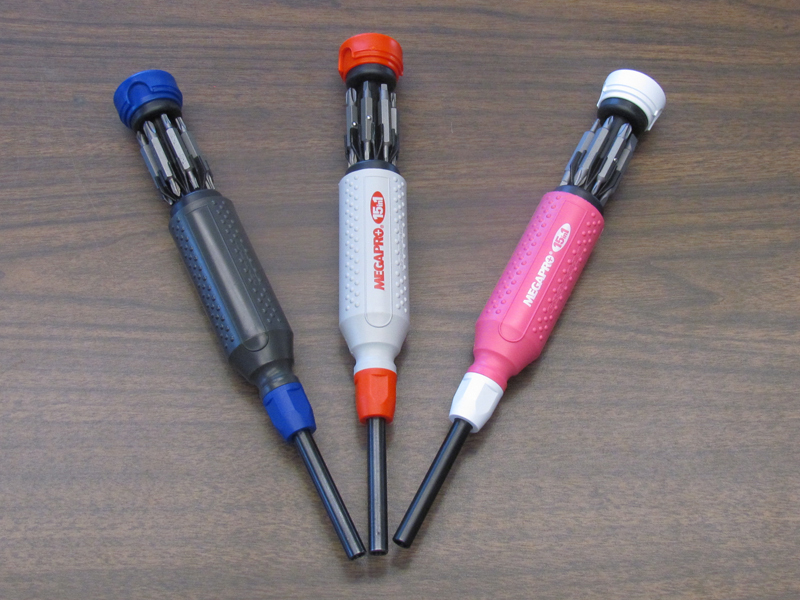 A thermoset polymer is a type of polymer that sets, and cannot be changed, once it’s heated or cured. This kind of plastic cannot revert back to its original form after it’s been set. It also can’t be softened or changed. Essentially, you’re stuck with the final product once it’s been heated. That’s why it’s absolutely crucial you iron out every single detail with your mock-up and model, before you move onto mass production. These kinds of molds are primarily used in automobile manufacturing, as they can be incredibly durable. They’re also used in certain inks, coatings, and adhesives. What Is It Commonly Used For? As you can see this type of plastic has a very wide range of uses. A thermoplastic is a relatively weaker plastic that can soften when exposed to high heat, and can even be reverted back to its original form. Once this kind of plastic is heated it can be shaped by different molding processes, including, pressing, blow molding and injection molding, and pressing. A thermoplastic can be likened to an ice cube. It holds its shape once frozen but will melt and can assume many forms once it’s heated. This kind of plastic is very versatile and has a wide range of uses. 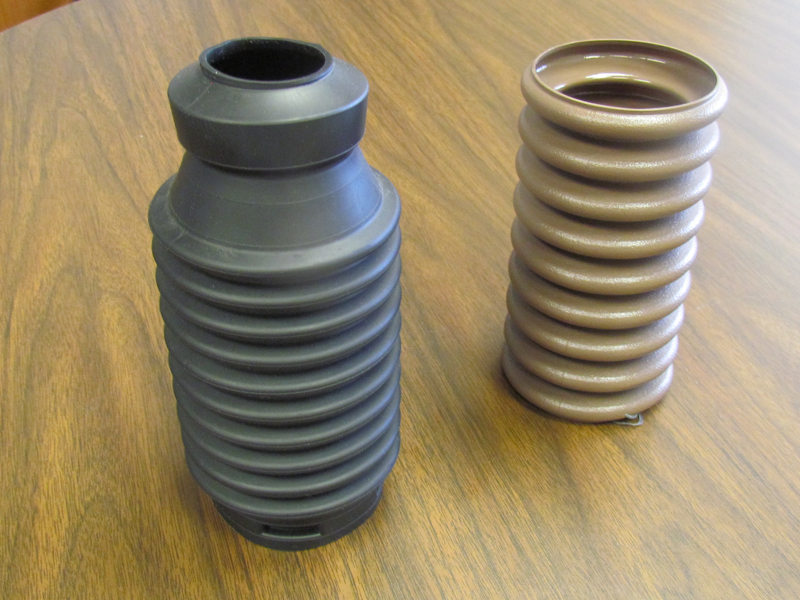 When choosing between thermoset polymer and thermoplastic, remember that thermoplastics are more pliable and can be re-used, but thermoset polymers are very rigid once heated and can’t be re-formed or molded once set. If you’re looking for a plastic molding firm to help you conceptualize and produce your new plastic mold, then we hope you consider SPI industries. We’ve helped to produce a large variety of plastic molds across a diverse number of industries. If you have an idea for a plastic product or component that you want to bring to life, reach out to our team today. Which came first, designing the mold or designing the rubber duck? In the case of The Good Duck the bigger question was which process, blow molding, rotational molding, or injection molding, will result in the best rubber duck ever? Following through on a crazy idea, Craig Wolfe premiered Betty Boop Duck in 1997, and his company, CelebriDucks was born. Originally invented in the USA, this American icon had long since been outsourced over seas. CelebriDucks returned the art of rubber duck manufacturing back to the United States. From NBA players, to Mr T, and KISS’s Gene Simmons, CelebriDucks are collectible rubber ducks fashioned after some of the greatest icons of film, music, athletics, and history. CelebriDucks was voted the top fan give-away by ESPN in sports stadiums all over the country. Not easily satisfied, inventor and CelebriDucks founder Craig Wolfe, had to take the product to a higher level. His most recent invention, The Good Duck, is known as the safest rubber duck on the planet. As most parents know, the first thing babies do when they grasp an object is to put it in their mouth. The Good Duck is made of medical and food grade materials that are soft and safe for teething children. FDA approved, PVC, Phthalate, lead and BPA free, The Good Duck is 100% Made in the USA, and it floats! With all great ideas comes research and development. Knowing he wanted a safe, soft, rubber duck that floated, Wolfe knew BPA free and PVC free was the way to go. Hence, his tour of blow molding and injection molding plants throughout the United States. As he bounced from factory to factory researching processes and materials he noted SPI Blow Molding in Coloma, Michigan was already using a soft material that could work. Safety and softness was key for the cute duck. Wolfe explained the determining factor for choosing SPI Industries and SPI Blow Molding was the expertise of the people compared to other plastic manufacturing facilities in the mid-west. SPI had the experience with reach and development to support The Good Duck project. Still, that’s only part of the story. The softness of the material, the product safety, and the desire for ducks of different color took much trial and error. Choosing the correct material, one that would remain very soft and hold design detail into molds is challenging. Fine tuning CAD designs, re-molding, sculpting, testing and refinement of molds was time consuming and expensive. Should a Good Duck be blow molded, rotationally molded, or injection molded? The Good Duck design was originally planned to be injection molded. Once Wolfe started working with SPI Industries, owned James Doster, advised him on a different direction. With injection molding the Good Duck would be in two pieces. The two pieces would need to be glued together. SPI engineers explained, “The plastic needed for the injection molding method would be too hard and would require welding.” Because a true rubber duck needs to float, it needed to be hollow. Blow molding it as one piece and sealing in the bottom was the solution. The next challenge was determining wall thickness. The soft material they wanted to use with the characteristics that make the Good Duck safe and chewable doesn’t flow like normal resins. Getting the wall thickness exact took some time. For the Good Duck to be completely safe, color needed to be molded right in the product. Adding color was a another challenge because colorant adds weight and effects the floating capability. Consistent balance was critical and very intricate. “Not easy technology, but SPI came up with a formula that is top of its grade with an age grading of 0 and up and thus completely safe for ALL ages!” reported Wolfe. SPI also provided a great supplier for packaging services for The Good Duck. American gift boxes are usually very expensive and drive up price point. SPI staff helped to locate a gift box manufacturer right here in the United States, keeping cost in line and also ensuring The Good Duck is 100% Made in America. Future plans are in place to expand The Good Duck line because it is so unique. 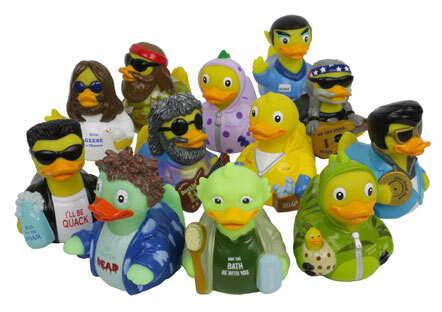 Communities who hold annual duck races as fundraisers can now use American made ducks! The Good Duck may also be employed as a promotional piece with custom embossing or silk screening of logos. When you consider creating a new part that is to be made of plastic and the tooling cost is considerable, it is most desirable to test the functionality of the part prior to actually building the tool. Creating a plastic prototype can help determine if the part will function as designed. 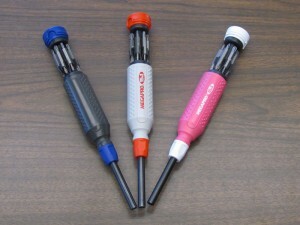 Modifications to a tool can not only be costly but degrade its overall performance and longevity. The CAD Systems of today, such as Solid Works, which is what we use at SPI Blow Molding and SPI Industries provide a great deal of power to make changes to a part quickly as well as draw all related interacting parts to test the stack up interference fit required in a final assembly. Solid Modeling on the computer has replaced the need for some part prototyping of the past. None the less, there are several current approaches to making a prototype of the product that remain relevant today. Historically the only approach was to have a model made by a professional model builder. The prototype may have been constructed of wood, plastic or metal depending on the size and function of the test needed to be performed on the prototype to prove its size and function. Many parts today still require a fully functioning prototype model to get exact data from which a mold can be built. It is a small price to pay for a good prototype part to avoid or at least reduce the iterations of design changes often required while designing and developing new parts and new products. Modern technology, such as Plastic Part Printing, has made prototyping not only less expensive but extremely quick to completion. In today’s fast paced manufacturing arena the quicker a product can move from the sales planning stage to the manufacturing floor the better. The life span of a consumer product has become incredibly short, thereby increasing, the pressure to develop new products even faster. An example of how SPI Blow Molding recently used Rapid Prototype Printing to solve a problem for one of our customers, The Best Bins, was the development of a Portion Control Cylinder which was to be retrofitted into a current bulk food container dispensing unit. Our engineering department drew the new portion control cylinder using Solid Works. The drawing was then sent to the Rapid Prototype Entity, where it was produced. The Plastic Printer, working similar to laying down ink, uses heated plastic resin instead of ink. The printer then makes repeated passes just as it would if printing on a piece of paper, only it continues to make passes laying down a thin film of plastic resin with each pass. Each pass prints a slightly different geometry, thus changing the shape of the plastic that is being printed. Each pass also moves up slightly preparing for the next pass. This process is repeated hundreds and hundreds of times, until a completed part has been produced. The part can be hollow or in nearly any shape, making it a perfect process to prototype parts for both Injection Molding and Blow Molding, which is what we do here at SPI. 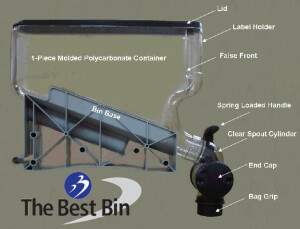 The Prototype Portion Control Cylinder was then tested for the amount of product it would allow to move though the dispensing unit on The Best Bins Bulk Food Container. The amount was not what we wanted. Four versions of the prototype part later we were all pleased with the outcome. At that point we were ready to build a new tool. The amount of time and money saved by being able to rapid prototype this part was significant to our customer. Without this testing capability we would have been forced to rebuild a mold cavity multiple times, which is both expensive and destructive to the integrity of the new tool. It should be noted this approach is best used to determine size and fit, not strength and toughness. Material characteristics will be very different in the prototype than in the final molded version. Another approach to prototyping is the concept of pulling forward a cavity in a multiple cavity tool. If the project is for medium to small plastic parts, then it is very common to use a tool in production containing several cavities of the same part. In this case it is sometimes wise to build one cavity and use that cavity to product prototype parts. If changes are required, modifications can be made to that cavity only, allowing all subsequent cavities to be constructed to the newly proven geometry; resulting from the testing on the prototype (pull ahead) cavity. This is also the prototyping choice where many parts are required for testing and the test challenges the strength and toughness characteristics. 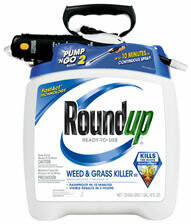 SPI Industries used this technique in developing a new plastic collar for Monsanto’s 1 gallon Pump n’ Go “Round-Up” dispenser. The new tool was to be 4 cavities. SPI used Mold Flow Software to assist with the tool design. It was then determined a Pull Ahead Cavity was the right way to go so extensive testing could be done before completion of the other three cavities. We did discover additional changes to be made and thus preserved the strength and durability of the final three cavities. 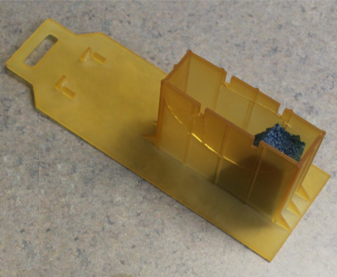 Reap benefits of creating a plastic prototype for production molding. SPI Blow Molding and SPI Industries injection molding specialize in custom solutions and mold design. SPI Blow Molding and SPI Industries injection molding specialize in custom solutions. Bring us your plastic parts and plastic product manufacturing challenges and let us get to work creating solutions. What is the best type of prototype for your plastic part? When you are manufacturing a new plastic part that is to be made of plastic you will save time, money, and stress by testing a mold prior to building the tool. Modifications to a tool can be costly and may degrade its overall performance and longevity. Accurate computer aided design (CAD) software reduces the need for prototyping of some parts. Nonetheless, there are many approaches and benefits to creating a prototype of a product. Determining the best type of prototype for your plastic part is your first step. Modern technology, such as Plastic Part Printing, also known as 3-D printing has made prototyping quick and inexpensive. With each new product’s life span shortening each year there is much more pressure to create new products and get them out on the shelf as soon as possible. Do you still have questions on which is the best type of prototype for your plastic part? Please give us a call. SPI’s skilled designers and engineers are experienced in the best practices for plastic part molds and the type of prototype for your plastic part that considers your time, budget and best testing for your specific part. Bookmark this blog for updates on plastic molding technology and plastics manufacturing. 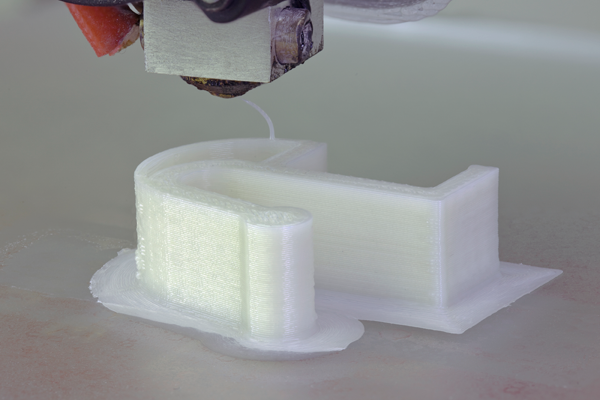 Our next blog will cover more information on rapid prototyping or 3-D printing as it is more frequently known. SPI works closely with a local technical college, Ivy Tech for 3-D printing molds. The Engineering and Design Technology students develop 3-D models for SPI customer review. Read more to determine if a 3-D model will be the best type of prototype for your plastic part. When you’re looking to design a plastic part or entire plastic product, the process generally follows a simple series of steps. However, the method of production you end up using may be any one of several which is determined by the geometry of the part and the functional requirements placed upon it. It’s important to understand molded plastic parts manufacturing. Fortunately, the steps are pretty straightforward once you understand the sequence of events needed to take a project from an initial idea to a final part design and manufacturing process. Below is a simple road map to consider and some examples of a couple of the most common molded plastic parts manufacturing methods. Go from initial design to a completed product. The first step is coming up with a design for your plastic molded part. This can begin with something as simple as a sketch on the back of a napkin. Your initial design should ultimately incorporate enough detail to have an engineer draw up a 3D Model of your proposed plastic part. This is the beginning point from which you will make all the changes and refine the initial ideas into a working representation of your parts. Also from this drawing you may want to get an actual prototype built. During this phase it is very helpful to work with a design team, which generally includes engineering, sales and manufacturing technical expertise, to assist with finalizing your design and preparing it for the next phase of the process. It’s important to define what type of testing needs to be done to prove out the feasibility of your part design and functionality. 2. Determine the molding process to be used. During this phase you’ll need to decide which type of molding method will be best for your product. The type of plastic molding process selected will depend upon your initial design, quantities needed and overall functionality of the part. There are several plastic molding processes available. Five of the more common general broad categories are Injection Molding, Blow Molding, Rotational Molding, Extrusion Molding and Thermoset Molding. Each of these processes have more specific sub groups of processes within them. The general category is all you will need at the beginning of your project. From these categories you will quickly narrow to the primary molding process most appropriate to your part. Two of the most common forms of molding plastic include blow molding and injection molding. Injection molding is used to produce parts made with a simple open and close function of the mold. Wall thickness and close tolerances can generally be held more consistent with injection molding than blow molding. Blow molding is used to produce hollow plastic parts and can accommodate unusual shapes. Both injection molding and blow molding can use a very wide range of resin materials that exhibit a similar wide range of physical properties, both visually and to the touch. Impact strength, flexible toughness, pliability, and many other characteristics can be achieved by both injection and blow molding. During the prototyping phase, if your budget allows, you’ll develop a plastic prototype that will resemble the final molded plastic part. The plastic prototype may be created using rapid prototype resin printing, soft tooling, or use single cavity pull-ahead tooling. There are many prototype processes available today. The design team will determine the best fit for your project. The budget for your project will also influence the number of times you can afford to go back and forth between your mock-up design and initial prototype. You want to keep the number of iterations to a minimum. You will be working closely with the designers and product engineers at this stage. The manufacturing team will play a large role in guiding what can and cannot be molded using the various plastic molding technologies. Once you’ve finalized your prototype you’ll move forward to getting the final mold designed for your plastic part or product. You will now be working with tool design engineers to determine the most appropriate way for your part to be arranged in the actual tool, also referred to as the mold. 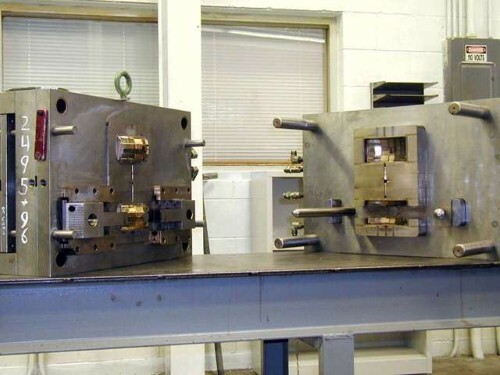 This process should, if at all possible, include the manufacturing technical team to determine how a tool, or mold, should be designed to run properly in the molding equipment from which the part will ultimately be produced. The plastic manufacturing company you use to produce your final plastic part will depend upon many factors. The type of molding you’re going to use for your final product, such as size of part and annual projected quantities will lead you to the group of processors for consideration. Most manufacturing facilities have specific specialties at which they excel. Some plastic molding companies do just the part manufacturing. Others do secondary assembly. Some manufacturing companies take the process all the way to finished goods. Fulfillment including packaging and shipping is not available from all molded plastic part manufacturers. You will also want to discuss the volume of parts each plastic manufacturer can handle. Small plastic manufacturing plants may not be suited well for large volumes. Others specialize in short run, highly technical molding. SPI Blow Molding is one of the Custom Industrial Molders capable of very difficult challenges. We range from high volume parts for the agricultural industry to low volume parts for the Medical Industry. 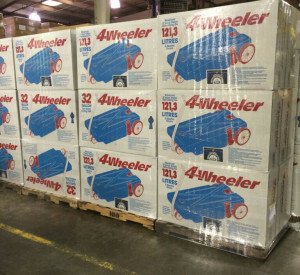 Large tanks for the recreational vehicle industry to small injection molded parts for the electronics industry. SPI Industries’ injection molding resume covers a very diverse range of products from plumbing fixtures to freight securement systems. Early discussions with potential manufacturers about volume, turn around, types of plastic resins available and fulfillment is highly recommended. It’s important to work with a plastics manufacturing facility that has experience producing similar style plastic parts, or is proficient in the style of plastic molding your product requires. You will also want to consider if you simply need parts or if you need the project handled from concept to completion. You may consider location of a plastic molding facility. SPI Industries and SPI blow molding are located in the South West Region of Lower Michigan and North West Region of Indiana. SPI Plants produce plastic molded parts for companies located in more than simply the Great Lakes Region. Our customers are located throughout the country. Depending on the needs of the customer, location is not always the most important criteria. Once your molded plastic parts ha ve been produced they may then be packaged and delivered to your facility for assembly and further distribution, or could be delivered directly to your customers. Discuss in detail your overall need for assistance with any and all steps in the manufacturing process. Determine the role of your molded plastic part in the overall production of your finished goods. For instance, if the molded part is just one of many components and requires additional assembly or further steps in the production process, a decision must be made as to who will do the additional work. It could be the molder or it could be you as the customer. Talk to your plastic parts manufacturer about assembly capabilities offered. Secondary operations are now offered by most plastic molders. SPI Industries and SPI Blow molding offer assembly and final processing for several customers. From single part production to total contract manufacturing and fulfillment, whereby we ship directly to your customers from your orders supplied daily. If the molded plastic part is a standalone product you’ll be able to immediately distribute the parts to your customers. This is generally not the case. Some manufacturing facilities will handle all of the shipping for you, while other facilities will simply deliver the finished product to you, and you will have to handle the delivery and shipping to your customers. If you’re ready to make a mock-up design, a plastic prototype, or have a question about the manufacturing process, get in contact with SPI Industries or SPI Blow Molding today. We can help guide you through the entire molded plastic parts manufacturing process. Most people within the plastics industry are familiar with creating a mold for plastic products. Or, at least have a general understanding of the process that goes into it. However, some general confusion still exists with product designers, engineers, and other professionals about the ins and outs of the process. There are a number of methods to make a plastic mold for products that will be used for manufacturing multiple quantities of products. Each method will take different amounts of financial investment and time. The steps below will get you moving in the right direction to create your very own plastic mold. What’s the quantity of plastic products you’ll be producing? The number of parts and custom plastic pieces you need will determine the type of molding you use, and the manufacturer you work with. Most manufacturers require that your entire build be at least 100,000 parts or greater. If this number is too high then you may have to shop around until you find the right manufacturer who is willing to do the job for you. Contact SPI Blow Molding or SPI Industries today to discuss quantities, larger plastic blow molded pieces or plastic injection molded pieces can be produced at lower quantities and still be cost effective. What will your budget be for this plastic mold? Your budget for your project should include the design and creation of your mold, as well as future modifications. Your budget can also influence the method of plastic molding you use, as some are cheaper than others. Also, the more complex your overall design, the more expensive the process is going to be. The type of plastic molding your project will require will be determined by the size and design of your product. You can also adapt your design to use a specific plastic molding process. For instance, when using injection molding you’ll generally have to have a smaller design. While, blow molding is usually used to create products, such as, containers, tubes and bottles. Your project design will influence the materials and types of plastics that need to be used. Sometimes, designs will have a specific material that needs to be used for the product to function, while other times the materials can be more flexible. Make sure you speak with your manufacturer to ensure you’re using the right material for the job. 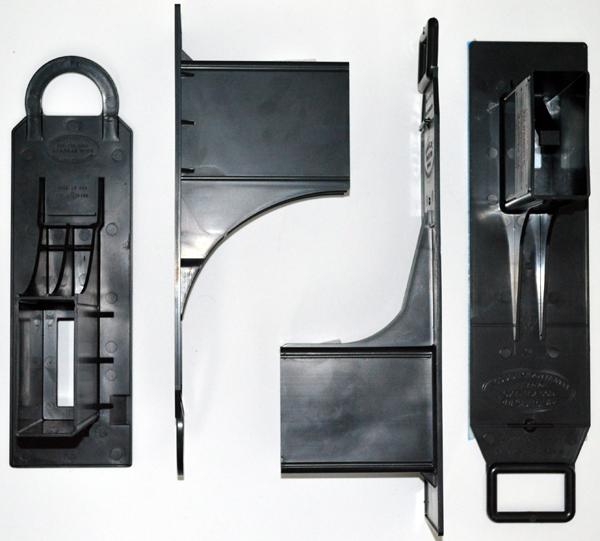 There are a variety of plastic molding methods, which can be used based upon your unique project specifications. By going through the process above you’ll have every specification you require to build the perfect plastic mold for your product. This isn’t a process you’ll want to rush, as a simple design flaw can have you starting the entire process again from scratch. If you’re ready to make a plastic mold or product, or have a question about the process, contact SPI today. No question or project is too challenging for our team! We can help to guide first time product inventors through the plastic molding process, or implement a unique solution for a product redesign that your are considering.